Do the Ethiopian People Have a Voice in Constitutional Review or Customary Law? The Constitution of Ethiopia recognizes at least two features in which the people have an extraordinary legal voice. First, constitutional review of proposed legislation and the resolution of constitutional conflict are conducted by elected representatives in the House of the Federation, not by professional jurists on a constitutional court. Second, the constitution recognizes and defers to the use of customary law and customary institutions, such as elders, to resolve conflict. 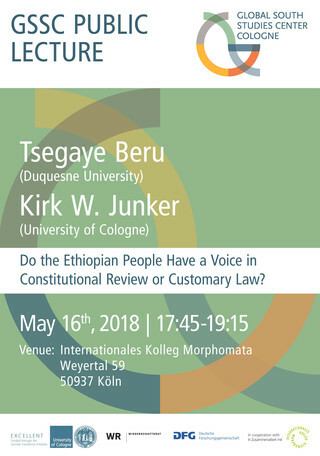 Beru and Junker have been researching these features in Ethiopia since 2009 through observation of citizens in dispute resolution, interviews of legal administrators and drafters of the Ethiopian Constitution, and through discussions with Ethiopian legal scholars. 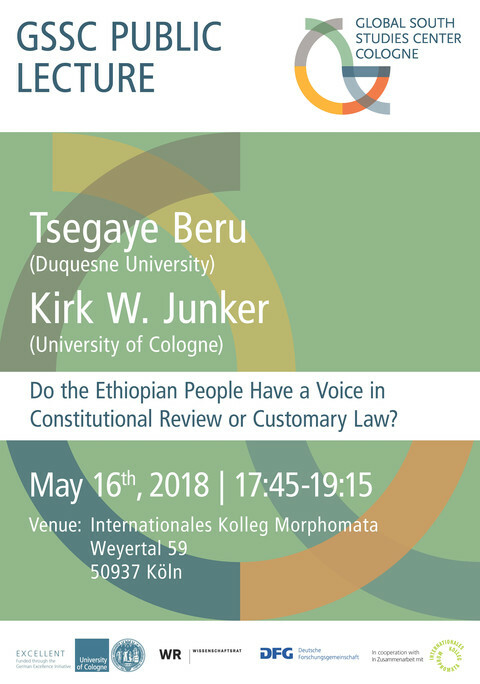 The latest results of that research will be published in Volume 43 of the North Carolina Journal of International Law in 2018 under the title "Constitutional Review and Customary Dispute Resolution by the People in the Ethiopian Legal System." This GSSC presentation will occur simultaneously with that publication.